OAKLAND, California – The 2016 NBA Finals on Father’s Day, June 19, was historic, and the city of Cleveland won their first championship since 1964, ending their fifty-two-year drought. The history, however, did not stop there. This was also a night where the Cleveland Cavaliers would capture their first championship in franchise history. This was also the night the Cleveland Cavaliers would capture their first championship in franchise history. A game worth every dollar for the fans that paid historically high numbers to see the game, which included the fan that bought a pair of courtside tickets on StubHub for just under $50,000. The highest price ever paid for a single game ticket; another part of this historical night. Draymond Green of the Warriors dominated the first half with 21 points, helping his team outscore the Cavaliers 27-19, in the second quarter, in addition to all the momentum heading into the half with a seven-point lead. However, the Cavaliers, led by Lebron James and Kyrie Irving, came out of the half quick and it did not take long to cut the Warriors lead. 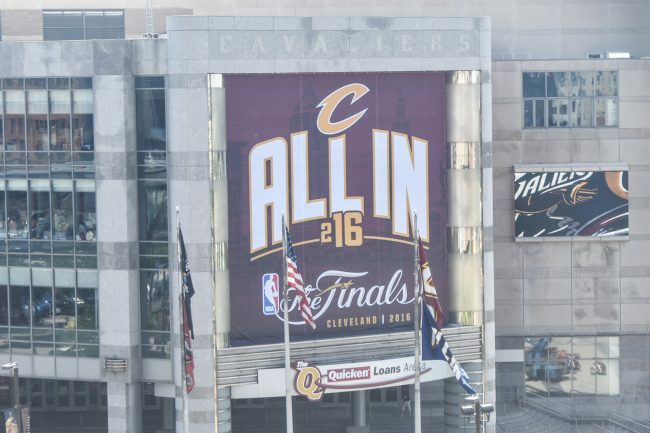 Halfway through the third quarter the Cavaliers reversed that seven-point lead in their favor. Game seven of the 2016 NBA Finals seemed to come with all the drama that can only be provided between two of the biggest international superstars. The last two minutes of the third quarter proved that as the Warriors went on a run of their own, led by Steph Curry, Klay Thompson and once again, in the thick of things, was Green. The Golden State Warriors, last year’s NBA Finals winners, took the lead with less than 30 seconds left in the third quarter and would hold that lead into the fourth quarter. A lead that would be lost seconds after the fourth, started by James, only to have it taken away a moment later. The constant back and forth leads at the start of the quarter would set the tone that carried on to the end. With a three-point lead, 10.6 seconds left on the clock, James drove to the basket going up for a dunk that would likely have been the dagger that ended the game. However, he was denied the basket with a hard foul by Green. “A championship-type play,” the announcers said, of Green’s foul that forced James to shoot two, and leaving a sliver of hope for Green and the Warriors. James went down, wincing and pounding his fist and legs against the floor in pain. The court was stormed by many of his teammates, coaches, and the team’s physicians came to the aid of the mega-star. James would dramatically but eventually rise and hit one of his two free throws, giving his team a four-point lead that would remain until the final buzzer rang. James then fell to the ground in tears of joy; a reminiscent scene from Michael Jordan when he won his first NBA finals championship; after his father had passed away. And for a city, with arguably some of the most die-hard fans of their teams, the 2016 NBA finals must have been just as chilling. One Response to "NBA Finals Historic"